The Empress usually represents general real happiness and much good fortune. It also represents creative actions that will lead to pleasurable experiences and sensations and the reverse – pleasure resulting in creativity. Every human being has a bipolar personality. The Empress represents the one half or one pole, while the other half is symbolized by the Emperor. Both these poles maintain a balance. 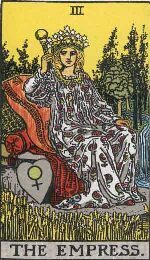 Empress represents the next stage of development from the High Priestess. While the Priestess represents purity, spiritual values and nobility, the Empress symbolizes bounty and fertility. The Empress represents the mother who is the vehicle of eternal cycle of creation. The Empress is blessed with a power to rebuild, renew, nourish and nurture the world. She is an embodiment of love, care, fertility, growth, warmth and compassion. She showers unconditional love upon her progenies and makes no demands for what she gives.